Ender Inciarte hit his first leadoff home run since the Braves opened SunTrust Park in 2017. ATLANTA — Maybe, just maybe, the Atlanta Braves needed a sign — both literally and figuratively — to break out of their Philly funk. With the team’s 2018 National League East division banner set to be unveiled ahead of Monday night’s home opener against the Cubs, All-Star first baseman Freddie Freeman hoped seeing it would be help the Braves bounce back after being swept by the retooled Phillies. 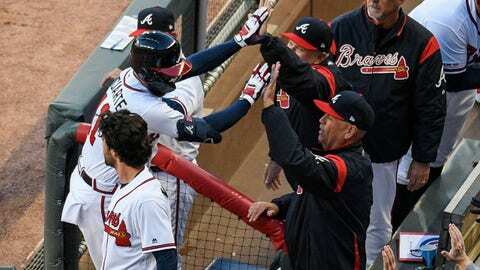 The banner may have provided it, but so did as an opportunistic offense — and specifically opportunistic hitters who are expected to share leadoff duties — took advantage of a myriad Chicago miscues in claiming an 8-0 victory, the Braves’ first of the season. ENDER STARTS WITH A FLEX. Ronald Acunã Jr. blasted his first home run of the season — a 421-foot shot — which was only a matter of time for the reigning NL Rookie of the Year. Meanwhile, Freeman — whose 71 extra-base hits in ’18 were eighth in NL — added a double of his own, Josh Donaldson and Nick Markakis each had two hits and Brian McCann supplied a pair of RBI in his Atlanta return. But the key to the Braves offense in 2019 may well hinge on the players who are expected to share the job at leadoff, and work to lengthen the lineup when they’re not atop the order. It was a hot topic this offseason, with the acquisition of Donaldson pushing Acuña and his 175 wRC+ at No. 1 (second-best in the majors to the Red Sox’s Mookie Betts) to fourth behind Freeman. That created the scenario with Inciarte back to the spot atop the order — where he hit 45 percent below league average in 2018 — against righties like the Cubs’ Kyle Hendricks, with Ozzie Albies — who faded after an All-Star first half in ’18 — expected to assume the job vs. lefties (like Jon Lester, who takes the mound Wednesday). Albies — whose 69 extra-base hits last season were 10th-most in the NL — doubled twice, the first of which came after Nick Markakis reached on an error before Albies’ at-bat. He also drew a walk and drove in a run in a three-hit game Monday in hitting sixth and Albies now has three walks in the first four games of the season after drawing 36 in all of 2018. Meanwhile, Inciarte, who had a high in Philly of a game-opening triple off Nick Pivetta in Saturday’s loss and the lows of a .231 on-base percentage, homered to jumpstart a four-run first inning in which the Braves capitalized no three errors. After Cubs left fielder Mark Zagunis misplayed Inciarte’s popup in foul territory, Atlanta’s leadoff man sent a 78.9 mph changeup 414 feet, jumpstarting a four-run first inning in which the Braves capitalized on three errors. The homer was only Inciarte’s second at leadoff since joining the Braves in 2016, the last coming in the SunTrust Park opener in 2017 to kick off the All-Star season in which he posted a .328 wOBA, ninth among the NL’s No. 1 hitters. Snitker’s stated plan to platoon the leadoff spot is rooted in Albies’ 141 wRC+ vs. lefties to Inciarte’s 82 (Albies hits 11 percent below league average vs. righties while Inciarte is at league average), and it may be as simple as a challenge for either to grab the job outright. "You get quick outs, the offense is gonna roll." Last season, there were 14 games in which both Albies and Inciarte each had an extra-base hit, and the Braves went 11-3 in them as the two struggled to get going at the same time during the season. Inciarte, as he’s done throughout his career, was better in the second half (112 wrC+) than the first (77), while Albies’ All-Star 120 wrC+ first half was met with a 67 in the second. With a lineup that includes three legitimate MVP candidates in Acuña, Donaldson and Freeman, the key is in maximizing what happens around them in the batting order — and specifically doing it in concert. Monday night, with seemingly everything turning up Braves as they feasted on a whopping six Cubs errors, Albies and Inciarte showed what can go so right when they’re both on, and in this case, opportunistic.